Royles, Jessica and Griffiths, Howard 2015. Invited review: climate change impacts in polar regions: lessons from Antarctic moss bank archives. Global Change Biology, Vol. 21, Issue. 3, p. 1041. Casanovas, Paula Black, Martin Fretwell, Peter and Convey, Peter 2015. Mapping lichen distribution on the Antarctic Peninsula using remote sensing, lichen spectra and photographic documentation by citizen scientists. Polar Research, Vol. 34, Issue. 1, p. 25633. Acuña-Rodríguez, Ian S. Gianoli, Ernesto Carrasco-Urra, Fernando Stotz, Gisela C. Salgado-Luarte, Cristian Rios, Rodrigo S. and Molina-Montenegro, Marco A. 2014. Antarctic Ecology One Century after the Conquest of the South Pole: How Much Have We Advanced?. BioScience, Vol. 64, Issue. 7, p. 593. Nielsen, Uffe N. Wall, Diana H. and Bardgett, Richard 2013. The future of soil invertebrate communities in polar regions: different climate change responses in the Arctic and Antarctic?. Ecology Letters, Vol. 16, Issue. 3, p. 409. Jones, T. C. Hogg, I. D. Wilkins, R. J. and Green, T. G. A. 2013. Photobiont selectivity for lichens and evidence for a possible glacial refugium in the Ross Sea Region, Antarctica. Polar Biology, Vol. 36, Issue. 6, p. 767. Quesada, Antonio and Velázquez, David 2012. Climatic Change and Global Warming of Inland Waters. p. 367.
di Prisco, Guido Convey, Peter Gutt, Julian Cowan, Don Conlan, Kathleen and Verde, Cinzia 2012. Understanding and protecting the world's biodiversity: The role and legacy of the SCAR programme “Evolution and Biodiversity in the Antarctic”. Marine Genomics, Vol. 8, Issue. , p. 3. Convey, Peter Hughes, Kevin A. and Tin, Tina 2012. Continental governance and environmental management mechanisms under the Antarctic Treaty System: sufficient for the biodiversity challenges of this century?. Biodiversity, Vol. 13, Issue. 3-4, p. 234. Hogg, Ian D. and Wall, Diana H. 2011. 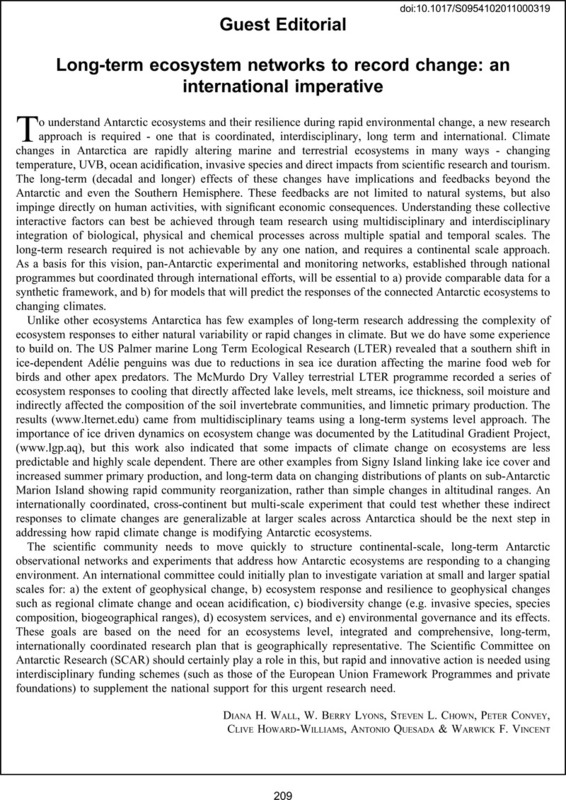 Global change and Antarctic terrestrial biodiversity. Polar Biology, Vol. 34, Issue. 11, p. 1625.